3 DVDs · 4 hrs. 40 mins. A BASIC SKILLS PROGRAM — IDEAL FOR STRUGGLING READERS! Some people are just great readers. It seems as if they can pick up any text, read it smoothly, and understand it quickly and completely. But for many of us, reading isn’t that easy. We might know most of the words, but we don’t always “get” all of the ideas: we struggle to make sense of what we read. When you can’t comprehend everyday things like news stories, magazine articles, movie reviews, product manuals, job applications, and even birthday cards, it can be frustrating and embarrassing. If any of this sounds familiar, and you haven’t known where to turn for help, then Video Aided Instruction’s Upgrade Your Reading Comprehension is for you! This engaging literacy course can help you become a more capable, comfortable, and confident reader; it’s like attending an “extra help” reading class with your own private tutor! This interactive program is jam-packed with lots of high-interest reading passages and coordinated exercises and activities. You’ll turn apprehension into comprehension as you learn proven strategies for increasing your understanding and building your vocabulary. Perfect for middle school students through adult learners (and struggling readers, in particular), this user-friendly course teaches you time-tested tips and techniques that dramatically improve your fluency and critical thinking skills. Plus, the convenience of this DVD set lets you work when and where you want — at your pace, on your schedule. So don’t be intimidated or held back for one minute longer. Now you can fully understand whatever you read, whether it’s a document at work, an assignment for school, or a website at home. You, too, can learn to love reading and excel at it. 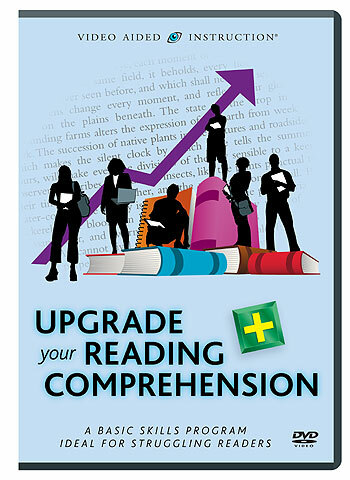 Let Video Aided Instruction’s Upgrade Your Reading Comprehension help you become a great reader! Copyright ©2012 Video Aided Instruction, Inc. All Rights Reserved.